Over Memorial Day weekend, a toddler fell into a gorilla enclosure at the Cincinnati Zoo. What happened next would lead to a fierce debate: Fearing the boy was in danger, a zoo worker shot and killed the gorilla, a 17-year-old western lowland gorilla named Harambe. The boy was unharmed. Many people, including animal welfare advocates, condemn the gorilla killing. Others – among them renowned primate expert Jane Goodall – say the zoo had no choice. Now the incident is raising a larger question: what is the value of keeping animals in captivity? Do the benefits zoos provide – like education, conservation, even entertainment – outweigh the risks to human and animal safety? A conversation about the value of zoos today, and how they could look different in the future. MR. TOM GJELTENAnd thanks for joining us. I'm Tom Gjelten from NPR. I'm sitting in for Diane Rehm today. You know, for many of us, zoos are places of wonderment that evoke fond childhood memories. For others, keeping animals confined behind glass and bars is a controversial and challenging practice. Zoos can be a powerful force in conservation efforts. They also raise questions about how best to help species thrive while minimizing danger to the animals and to humans. MR. TOM GJELTENHere to discuss the role of zoos in society today and how we might rethink them for the future are Dennis Kelly. He's the head of the National Zoo here in Washington. And Barbara King, who's a biological anthropologist at the College of William and Mary. And as soon as we get him on the line, from an NPR studio in New York, we will have Andrew Revkin of the New York Times. Thanks to all of you. Welcome to "The Diane Rehm Show." MR. DENNIS KELLYWe're glad to be here. GJELTENGood. So it's summer time. Many of you will be vacationing and a family visit to a zoo might well be in your plans. We'd like to hear from you, your thoughts or concerns about zoos. Call us with your comments or questions, 1-800-433-8850 is our phone number. Our email address, if you want to email us, is drshow@wamu.org. You can also send us a message via Facebook or Twitter or from -- on our website, which is drshow.org. MR. ANDREW REVKINI'm thrilled to be here. GJELTENGood. Okay. There you are. Dennis Kelly, let's start with you. So we had this incident, this very controversial incident in Cincinnati where the decision was made to shoot and kill the gorilla when he was holding that 3-year-old boy. I'm sure you don't like to second guess the decisions of other zookeepers, but could you put yourself in his shoes? What would be the decision that you would have made if you're willing to go there, if you were in that situation, if you had a similar incident at the National Zoo here in Washington? KELLYYes, Tom. Thank you for that question. And I have put myself in Thane Maynard's shoes when he made the very, very difficult decision to kill that gorilla. For us, human life always, always comes first and I know the pain that Thane and his team went through. GJELTENThane Maynard, the director of the Cincinnati Zoo. KELLYYes. And his staff, I know, was and still is devastated by the decision that they made. And I would say you can -- and as you said, you can never put yourself in exactly the same situation, but I would've done the same as Thane did to protect the life of a human in that situation. GJELTENHave you ever had anything remotely similar happen to you at the National Zoo? KELLYI've run another zoological institution and we have been in situations where we are -- we have a dangerous animal acting in a situation. We do routinely rehearse, as an accredited -- as and AZA accredited institution, we're required, at least once a year, to perform a rehearsal of a situation like this and we're constantly testing ourselves. And I've never had to kill an animal, but my team is prepared to always protect the life of a human. GJELTENAnd are there any decisions or any options that you might consider now going forward in terms of, you know, higher fences or, you know, wider moats or anything, any kind of practical changes that you might make? KELLYLike all of our colleagues around the AZA, you know, Association of Zoos and Aquariums, we're constantly looking at making our institutions as safe for people and as good for animals as they can possibly be. So actually we began about three years ago and looked at all of our exhibits and tightened them up. We think that, I believe that, we have an even bigger responsibility for people who might be distracted, for small children, and we've actually made changes to our lions, our tigers, our gorillas, our orangutans, giant pandas and we're looking at our cheetah exhibit right now to see if there's ways to make it even more safe for a small child. GJELTENBarbara King, you know, there's been a huge outpouring of not just outrage, but grief at the death of Harambe, the gorilla who was shot in Cincinnati. As a biological anthropologist, do you have any sense of what might have been in Harambe's mind when this boy suddenly dropped into this enclosure? MS. BARBARA KINGWell, thank you, Tom. Harambe was certainly a magnificent animal. He was 17 years old and in the prime of life. He lived with two females in his enclosure. I don't want to suggest that I can mind-read a gorilla. That's not the way I want to go. My science, of course, depends on visible and expressed behaviors by primates. What we can perhaps suggest, looking at the tape that has been released to the public from the zoo, is that there's a lot of thinking going on in Harambe's mind, trying to assess this completely unprecedented event. MS. BARBARA KINGHe evolved, after all, to be a protector. That's what young male gorillas do. There were two females in the enclosure. I think he was very rapidly trying to assess what to do. You could see, really looking at his eyes, that he was struggling, I think, to figure this out. GJELTEN...in terms of the tape of him and so forth and tried to assess what he might be thinking? KINGYes. And, you know, I have to say that I certainly agree with what Dennis has said that things were moving very rapidly. I am absolutely positive that that entire zoo team in Cincinnati was doing everything they could and assessing rapidly moment by moment. And when people suggest to me that a tranquilizer gun might have been used, I do know from talking to large animal veterinarians that there is a very dicey period of time between letting that dart fly and what the animal might do. KINGI just would emphasize that Harambe, to me, appeared to be doing exactly what he should have been doing for his age and for his species. And there was no, as far as I could determine, aggressive intent. The fact is just that given his great strength and the unpredictability of the situation, the call was made as it was made. GJELTENWell, what was he doing? KINGHe was dragging this child rapidly as gorilla males will drag objects, branches, other items that appear before them. He was not in any way thrashing the boy around or throwing the boy against hard surfaces, but those hard surfaces did exist. What I have been trying to do in the weeks since is to suggest that it is very misguided and very unnecessary to get into a blaming mode either of the zoo people or of the parents and instead, focus on some larger questions that go beyond moats and fences and making enclosures better to really look at why he was there in the first place. GJELTENAnd what would you say in response to that? What would you be saying? KINGI think it is time for us to pick up on what's happening in this country and build on it and start thinking about tipping that ratio between zoos and sanctuaries towards more sanctuaries. Zoos, of course, are said to have conservation and education functions, but their main goal, their main purpose is human entertainment and humans do come first. We've heard that and we know that. And I think that, for many animals today -- we know, for example, that the Baltimore Aquarium is moving its citations right off exhibit. KINGThis was just announced last week. We know many, many zoos are letting their elephants go to sanctuary. This is the kind of conversation that I think we do need to be having. These animals are very smart and they feel their lives as well as think their lives. GJELTENWell, Andrew Revkin, we got in touch with you thanks to Skype and let's keep that conversation going with you. What are your thoughts about the lessons that this incident teaches us and what will you be emphasizing going forward as you write your Dot Earth blog for the New York Times? REVKINWell, when I first started covering it in (unintelligible) thing there was the social media reaction, which was so visceral and irrational. It says a lot about our species in some ways. Finger-pointing in all directions, very little focus on the facts. You know, as a blogger, I moved from 30 years of journalism to blogging (word?) years ago, along with my other staff and that arena is tough. The same thing happened, of course, with Cecil and so many other things. GJELTENCecil being the -- from Rhodesia, the lion who was killed in Rhodesia. REVKINLion, yeah. And, you know, animals are particularly something that people pay attention to (word?) including poor, struggling people. But what I started to write, I started reflecting on my own zee experience. I grew up in Rhode Island and I remember, as a kid, going to Roger Williams Park Zoo, which was, at that time, you know, we're talking about the '50s and '60s, a pretty retro zoo with the bars and concrete. But it was a, for me, a place of wonder, especially for (unintelligible) have that in a zoo. REVKINEarlier, you know, there's special parts of our population who will never have the privilege of going to a national park or traveling overseas. And that was my norm, you know. And I wrote -- I included a photo of my son who was then five years old. He took his first photograph -- six -- of a gorilla at the Bronx Zoo and that was (unintelligible) thrilled with the experience, walking through that glass and tunnel. REVKINBut then, you know, again, I sort of looked at these questions and come out as sort of a zoo consumer and a science writer saying, there's some really big questions here going forward. GJELTENWell, we're going to try to improve the line that we have with you, Andrew, 'cause you were breaking up there a little bit. That's Andrew Revkin. He writes the Dot Earth blog for the New York Times. He's also a senior fellow for and environmental understanding at Pace University. I'm also joined here by Dennis Kelly, he's the director of the Smithsonian's National Zoo here in Washington, and Barbara King, who is a biological anthropologist. And she is the author of "How Animals Grieve," which is subject we're going to be talking about. GJELTENStay tuned. I'm Tom Gjelten. GJELTENAnd hello again. I'm Tom Gjelten from NPR. I'm sitting in for Diane Rehm today. And we're having a fascinating discussion that I'm sure all of you will want to follow closely. We're talking about the future of zoos in the United States, in the aftermath of the tragic death of Harambe, the 17-year-old gorilla who was shot and killed after a three-year-old boy fell into his cage. GJELTENMy guests here in the studio are Dennis Kelly, who is director of Smithsonian -- the Smithsonian's National Zoo. He's also with the Smithsonian Conservation Biology Institute in Front Royal, Va. Also here in the studio, Barbara King, a biological anthropologist and professor of anthropology at The College of William and Mary. And not only that, Barbara is also an NPR colleague. She blogs for the 13.7 Cosmos and Culture blog on the NPR website. And she has been writing about this incident there and the lessons that we may draw from it. We also have from the studios of NPR, New York, Andrew Revkin, who writes the Dot Earth blog for The New York Times and he's a senior fellow for Environmental Understanding at Pace University. GJELTENAnd, Andrew, we're going to be going back to you, but we have had some problems with the line for some reason from New York. So we're trying to get those fixed. So let's talk about some of the policy issues that this incident raises from the zoo point of view. Barbara, do you think that the fact that a species is endangered should ever be a factor in deciding what to do in an emergency situation. I mean, you know, the lowland gorilla is an endangered species, correct? GJELTENShould that have even entered the minds of the zoo people, you know, as they sort of -- not only as they reacted in that specific situation but sort of in the management of that -- of the gorilla more generally? KINGYes. As I said, I don't want to second-guess or comment on any of the decisions made at the Cincinnati Zoo that day. I don't believe that the endangered status of Harambe really could have played a role. But certainly, in terms of zoo management, yes. These great apes are highly endangered, not only gorillas but orangutans, certainly, and chimpanzees. But I, again, I think the larger question is, how do we manage animals like this, when we know that more and more they have such incredible abilities to use tools to make emotional attachments, to really need a great deal of freedom to express their natural behaviors and their natural personalities? KING...of confining them in this whole range of situations? And I do include zoos. As I was preparing for this show, I realized that there are slightly over 200 accredited zoos in the United States. But there are many more hundreds of unaccredited zoos. There's a very wide variety of conditions in which these animals are kept. And some of them are quite horrific. KINGYou know, I feel as if I have a list in my head of accidents, escapes, deaths. You know, 16 months ago, there was a beautiful 16-month-old gorilla who was killed by a hydraulic door closing on her body at the San Francisco Zoo. Last week, there was a lion whose tail was chopped off by an accident at the Hydraulic Zoo. And we need to focus on accidents. But even more than that, let's ask the question, is it time to really recognize the sacrifice these animals are making and think more about situations that are sanctuary-like. GJELTENDennis Kelly, tell us a little bit about the animals at the National Zoo, your zoo. What percentage of them are born in captivity? What percentage of them have been born at your zoo itself? Where did these animals come from? KELLY...or a situation where the animal can no longer function in the wild, say, a bald eagle that can't fly. And so those situations where we are not taking animals from the wild and, in many cases, there are several cases where the animal no longer exists in the wild. I'll take the scimitar-horned oryx, which has been extinct in the wild for five decades. But the zoo, working with other zoos and with private entities both here in this country has begun a reintroduction program back into Chad. We introduced, just a month ago, the first 25 scimitar-horned oryx, which were captive bred in Texas and in American and in the UAE, to reintroduction. KELLYAnd that's the other aspect that Barbara is so correct, that we have an incredible responsibility to care for these animals well. And we're learning all the time from her work, from others' work, about how to care for animals. But at the same time, we're in the midst of the sixth grade extension. And there's a couple dozen species that we are working now -- we have successfully reintroduced in the wild and some that we haven't. And the extinction crisis that we're in right now, the loss of biodiversity, is a place where sanctuaries play a role, where zoos play a role, where we've got to balance off this issue of extinction versus keeping animals in human care. KELLYI'll point to the discovery of the chytrid fungus, which is wiping out a third of all frog species on the planet. Those frogs that are surviving the chytrid fungus are only doing so because of human care. The -- and that fungus was discovered at the National Zoo. But the national animal of Panama, at one point, in Panama only existed in human care because the fungus was wiping it out in the wild. The role of zoos has to evolve to work with sanctuaries, to work with wild places, to work with the 10 percent of the planet that is reserved for wild animals. GJELTENAndrew Revkin, let's talk for a moment about what it's like to be in a zoo for an animal. Barbara mentioned at the beginning that Harambe reacted to that -- the appearance of a three-year-old boy in his enclosure in a totally instinctive and natural way. But how different is the -- how different is it to be a gorilla in captivity, as opposed to be a gorilla in the wild? REVKINWell, I'm sure she knows the literature and through experience knows more directly about this. But what I -- my reporting through that week led me to people who say, essentially a gorilla that's been born in captivity -- in this case, it was Florida, right? Wait, where was it? REVKINBrownsville, yeah, he was born in Brownsville, Harambe, and then moved to this zoo. And, you know, he has never -- Marc Bekoff, who's an animal ethics biologist, behaviorist, says that's just not a gorilla, that you're actually not seeing a gorilla. GJELTENBecause he doesn't know what it's like to be a gorilla in a sense. REVKINWell, it's never been -- it's never experienced gorilla-hood in the full sense of being a silverback in the wild. And, of course, you know, this gets to some of the points you just heard, really important ones, from Dennis about, you know, there comes a point when there is no wild either. We're in the theanthropicy and this age of us. I was just in Nairobi recently, where Nairobi is essentially spilling into a Nairobi national park in a way where it's just bizarre to go there and you see people in their Land Rovers and then in the distance to see the skyline and the animals are kind of in the middle with all kinds of stresses, including from roads that are being built through territory that was supposed to be a park. REVKINSo we're going to face all kinds of questions. I think Dennis had it just right. You know, it's a sliding scale things where there'll need to be sanctuaries, there will need to be places where people who are not privileged enough to go see animals in the wild can experience them. This gets to the question of sort of virtual experience. Or maybe the zoo of 20 years from now, maybe it'll be more like where you really are watching from a distance a conservation effort in an area that's not barred or moated. GJELTENWhat do you mean, watching from a distance? What do you specifically mean? REVKINWell, we're in the age of virtual reality, you know, where you go into a room and you're experiencing the -- close interaction with the animal but you're not in the same space. You know, the animals have some rights and privileges. I've written about this concept of non-human personhood. And this, of course, gets to the other point that Barbara made about the other places where animals that we know have extreme intelligence and feelings. Pigs are probably the ultimate example of a food animal that we -- I don't see anyone, you know, Facebooking about the daily, hourly, every second, mass-slaughter of pigs that have never been a pig either. GJELTENBarbara King, you've been writing about that. KINGI actually think there are many committed, science-based animal activists doing just that, Andrew. So pigs and cows and goats and chickens are a concern of many people, including me, as we begin to realize that they too are sentient and that they too very much need our concern. In other words, I see this on a continuum. That zoos, to some degree, tend still to focus, at least in their advertising and their luring of the public, on, you know, what are called the charismatic mega fauna, the very large animals, the pandas and the elephants. KINGAnd then, as I thought, it was very interesting that you mentioned frogs and oryx, which I think are great examples. But, if I -- if it would be okay, if I could ask you a question. I understand that $56 million was spent on the relatively new elephant trail at the National Zoological Park at a time when many other zoos are essentially divesting themselves of elephants. So if we think about $56 million going to bring elephants to a zoo and the surrounding area for those elephants at a zoo. To me, that's problematic. That's a lot of money that could go directly to helping animals, specifically elephants, in the wild or in a sanctuary. KELLYYou're right. $56 million is a lot of money. And it does go to the fact that we really don't know that much about elephants. And that the lines of research and inquiry that we are investigating about elephants, to do right by them, is expensive. Conservation is expensive. We discovered the disease that kills about a third of all baby elephants, the herpes virus. And it appears that that disease has been around a long, long time. We established the National Herpes Lab that -- where we are assisting not only people in this country but around the world in detecting this disease. We don't know much about this disease at all. KELLYWe are working on cognition, as you know, with elephants, the extension of the work that's been done, that you've talked about in great apes, where we are showing about cognition, we're recording it. We're working on communication with elephants. Research is expensive. Conservation is expensive. GJELTENDennis Kelly is director of the Smithsonian's National Zoo. And he's talking about some of the difficult policy decisions that he faces as director of the zoo. I'm Tom Gjelten. This is "The Diane Rehm Show." And remember, you can join our conversation by calling us at 1-800-433-8850. You can email us at drshow@wamu.org. And we'll be getting to your phone calls and comments quickly. Andrew and Barbara, I want you to both respond to what Andrew -- to what Dennis said a little earlier, which is the important role that zoos now and in the future will play in protecting endangered species. I mean, zoos do have this -- do have an important conservation function that goes well beyond the entertainment function they play. GJELTENYou have both mentioned that maybe there's a -- we should have a different type of zoo in the future. Andrew went so far as to say that maybe zoo visitors should experience animals from a virtual reality -- through a virtual reality technology. But, Andrew, would you agree with Dennis that, even in that situation, zoos are necessary in order to play this conservation role to protect endangered species? REVKIN...the zoos within a state -- oh, is it USDA? See my students at Pace -- our students at Pace University, a clinic there, they wrote legislation that just got passed here in New York State related to elephants -- traveling circuses with elephants. And you're seeing this, as you mentioned earlier, that we're slowly getting the elephants out of circuses. But public pressure is part of that. And the same thing happened with "Blackfish," the film, and with orcas and SeaWorld. REVKINSo the more the public becomes attuned to getting the zoos that are not accredited in line with the conservation pledges of the zoos that are, the Wildlife Conservation Society, the Bronx Zoo, the National Zoo, you know there's a whole -- they're in a different universe than many of the places that are out there. So what could we do? What are the laws? Where are the levers? GJELTENDennis, I'm sure that you have contact with the people that visit the National Zoo. People come from all over the country to visit Washington and the National Zoo is a real treasure of Washington. In your conversations with visitors -- and how long have you been at the National, how long have you been director there? KELLYI'm in my seventh year as director. GJELTENOkay. In this time, do you see sort of the attitude or the expectations of zoo visitors changing? Do you find that visitors are becoming more sensitive and knowledgeable about some of these very tough issues? KELLYTom, there is a shift going on. And I would say it's particularly happening with what we call the millennials. They are asking -- they're enjoying a zoo experience. We continue to be the favorite place in our area, in Washington, for families with children. It's a magical experience, 2.6 million people come. But we're also seeing particularly younger people question the relevance. The issues that Barbara has brought up is -- and that Andrew is bringing up, I think are even more relevant with Andrew's students at Pace. And they're saying, there is a conundrum, there is a conflict. We are losing species at the greatest rate in the last 65 million years, and yet there is a struggle with, why do we keep animals in captivity? KELLYWhy do we have factory farms? You know, why do we have animals in horrible conditions to feed an ever-growing population on our planet? It's a struggle, particularly for younger people coming along. GJELTENDennis Kelly is director of the National Zoo, the Smithsonian's National Zoo here in Washington. We're talking about the future of zoos and what all of us who love to visit zoos should be thinking about going forward. I'm Tom Gjelten. We're going to take a break. When we come back, your questions and calls. Stay tuned. GJELTENI'm Tom Gjelten from NPR. I'm sitting in for Diane Rehm today. And we're talking about the future of zoos in America. And this is all, of course, in the aftermath of this tragic incident in Cincinnati, where a three-year-old boy fell into a gorilla enclosure, and the zoo workers there made the difficult decision to shoot and kill the gorilla in order to protect the little boy, who did escape unharmed from that incident. GJELTENMy guests here in the studio are Dennis Kelly, who is the director of the National Zoo here in Washington and the Conservation Biology Institute. He also oversees the Smithsonian Conservation Biology Institute, the Conservation Biology Institute, that's in Front Royal, Virginia. Also Barbara King, who is a biological anthropologist and professor of anthropology at The College of William and Mary. She's the author of "How Animals Grieve" and "Personalities on the Plate: The Lives and Minds of Animals We Eat." And that's forthcoming, isn't it? It's not out yet. GJELTENAnd Andrew Revkin is joining us from the studios of NPR New York. He writes the Dot Earth blog for The New York Times, and he is a senior fellow for Environmental Understanding at Pace University. And Barbara, just before the break, I asked both you and Andrew to respond to Dennis' argument that zoos, for all that might be said about them and all that, you know, might change in the future, will continue to play an essential conservation role with respect to endangered species in particular. Do you see an important -- do you see that conservation role being important for zoos? KINGI definitely take Dennis' point with -- he's much more knowledgeable about these specific examples of animals that are on the verge of extinction. I don't think I would characterize myself as a complete zoo abolitionist. But I would like to point out that the vast amount of breeding that goes on in accredited zoos is to keep animals in the zoos. In other words, we're breeding gorillas so there are more gorillas in zoos and so forth. So it's very much of a perpetuating cycle. KINGWith respect, I would suggest that Dennis has mentioned that the zoo is a magical place. That is a really anthropocentric comment, and of course it's understandable given that he's a zoo director. But we want to look and see once all of these animals are bred, is it a magical place for the animals. And, you know, in the United States the policy is often to put animals on contraceptives if the species' survival plan or the studbook, the cooperation across zoos, across the United States, suggests that that is the appropriate -- excuse me -- thing to do. KINGBut in many European zoos, it's cull, not contracept. We know many, many example where animals in European zoos are bred and then culled. Listeners may remember Marius in the Copenhagen Zoo, who was killed as a surplus animal. They may remember a nine-month-old lion at the Odense Zoo in Denmark was killed as a surplus animal and dissected in front of children. This conversation, I think, should be a cross-cultural and worldwide conversation. There's something very wrong when a zoo takes responsibility for animals and yet then decides, and again this is in Europe, specifically that the animal should be killed. KINGHow does that fit in with conservation, and how does that fit in with zoos as magical places? GJELTENDennis Kelly, are there sort of standards, ethical standards, that zoo administrators like yourself discuss not only here in the United States but on an international basis? KELLYWe do discuss the ethical standards, the standards of culling, the standards of breeding, and I will tell you it's the policy of the National Zoo to not cull for population management purposes. GJELTENWe have a ton of emails here, folks, and I'm going to direct some of them to you specifically, each of you. First of all Laura, who is writing from Glen Arm, Maryland, wants you to explain the difference between zoos and sanctuaries, particularly with regard to their accessibility, and to the extent that animals are moved out of zoos and into sanctuaries, does that mean that the public is no longer able to see them or experience them? KELLYIn answer to the question, the definition of zoos is a continuum, and the definition of sanctuaries is a continuum. And there are some sanctuaries that offer limited access to the public. In our own case, we -- the wisdom of the Smithsonian was to create a research and center in Front Royal, Virginia, on a former military base. So that's closed to the public. But we do let animals range freely for both research and breeding purposes out at a place like Front Royal, for cheetah, clouded leopard, red panda, black-footed ferret. KELLYBut the answer is generally in sanctuaries, there is limited access to the public and whereas zoological institutions, there's generally more access and more transparency about what is going on with the animals in the collection. GJELTENWell, Ronah writes from Rockville, Maryland, and I realize that her experience might be unique, but she says a few years ago, she had the privilege of traveling to Tanzania for a safari visit, to the Serengeti, and seeing the animals in the wild was such a wonderful and emotional experience, a subsequent to the D.C. zoo had her in tears. She a zebra pacing in a cage, and she compared that to what she saw in Serengeti. GJELTENShe said, I realize not everyone can travel to Africa, but I would rather see big game sanctuaries in the U.S. than what we have now in zoos. So there -- even with a sanctuary, I mean, her example, it may not be realistic. I mean, you know, you go on a safari in Africa, and you actually can see animals in their natural habitat without them being in zoos, but that's obviously not a realistic option here in the United States, is it, Dennis? KELLYThat's correct, although we are -- you know, there are places where we have bigger enclosures. We don't have cages at the National Zoo, as you know, for zebra. But her point is a good one, is that there are very, very people that are going to have the wherewithal on our planet to be able to travel to Tanzania or to Kenya to see those kinds of animals. But there are issues with many species, whether it's fish, whether it's small vertebrates, that need the help of sanctuaries, they need the help of zoos to prevent them from extinction. GJELTENYou know, here's a thought from Scott. He writes, if it wasn't for zoos, most people would not even know that animals -- that a lot of these animals exist. You can't mobilize preservation efforts for something people don't even know about. Andrew Revkin, you wanted to jump in. REVKINYeah, yeah, well, one quick point on -- well, it's relevant to both things. I'm going to circle back to accreditation. Another really important point that Mark Bekoff made was maybe part of accreditation increasingly should be transparency on how much money that zoos raise goes to conservation in the field so that the Serengeti great migrations can persist into this century. REVKINAgain, I was in Nairobi recently and met with safari company owner who was talking about all the threats. Wheat cultivation is moving in, and fences are going in, and so the more than zoos are, I think, are a vital conduit of conservation awareness, and the funding commitment for conservation science in the field, I think, makes a lot of sense to me. GJELTENAndrew, Todd sent us a tweet. He wants to know, how is it that there are zoos operating without accreditation. REVKINWell that -- I'll maybe -- I think Dennis probably knows the answer to that better than I do. KELLYWell that's right. There are -- the USDA authorizes about 2,000 -- gives out 2,000 licenses a year to exhibit animals. To be accredited by the Association of Zoos and Aquariums, the highest accreditation standard in the world, only about 230 are good enough to do that. The rest of them are regulated by the Animal Welfare Act, enforced by the USDA. REVKINSo that strikes me, again maybe I'll get my Pace students involved in a new effort to lobby Congress on the federal scale to see what can be done to change those numbers. That's a pretty woeful ratio. KINGYes, among the U.S. accredited zoos is included Orlando Sea World, correct? KINGAnd Disney Animal Kingdom, correct? KINGOkay, so please keep in mind that these accredited zoos do include place where, until very recently, cetaceans were bred, and they entertain us in shows, and we know that there has been national outcry about SeaWorld, and that should be part of this conversation. It is also clear to me that having spent time at Amboseli National Park, where I did my anthropology field work on free-ranging monkeys, there is a tremendous difference, of course, between the wild and captivity. KINGBut that doesn't mean that we shouldn't call on the public to really help us bridge that gap in a way that is fairer to animals. To build on something that Andrew said, I think we shouldn't underestimate the public's ability to appreciate that we're asking animals to be ambassadors and life in confinement, in captivity, at a great cost, that we can make use of animal storytelling, animal documentaries, virtual reality, which has had a huge impact on me, in motivating people for conservation. There are alternatives. REVKINWith respect to that Facebook, the Facebook question that the reader had, I mean, the social media, just quickly, the -- I mean whatever he did, there's a student in Nova Scotia who I wrote about four or five years ago who -- an art student created on Facebook what looked like a Facebook conversation between people, friends, but it was between endangered species. And it was linked to a World Wildlife Fund site with lots more information on endangered wildlife. REVKINAnd it was done by Isaac Fresha, this undergrad in art school in Nova Scotia, creating -- hundreds of thousands of people were engaged with that instead of engaging with spit-balling, you know, these mean comments. If there's a way to channel that energy, you know, and again I think there might be, into this kind of effort, maybe there's -- maybe there's possibility for good outcomes on the Internet. GJELTENLet's see what some of our listeners have to suggest or ask on these questions, first of all Ray, who is on the line from Cincinnati, Ohio. You're on the Diane Rehm Show, Ray. RAYHi, thanks so much for taking my call. I have heard tell that there are some plans to put some of the endangered large fauna, like elephants, rhinoceros and such, in similar habitats on other continents, like Australia and the Southwest in North America, in order to preserve the species. What does your panel think about that? GJELTENDennis, we were saying that, too, it's not feasible to have a safari, sanctuary, sort of like in Africa, here in the United States. But are there places in the United States where sort of something like this could be done? Ray talks about perhaps putting African animals in the American Southwest, where the climate might be more similar. KELLYRight, and there are a number of both accredited and private landowners who are interested in conservation and who will take the black -- the black rhino that is so endangered and so valuable, being hunted for its horn, that some conservationists are considering taking action to bring some of those to Texas, where they would be safer. And that is, again on the continuum of conservation, that is an alternative strategy that could work. KELLYRemember, elephants now were being killed at the rate of about 96 a day, and that campaign was brought to light by the Bronx Zoo and the Wildlife Conservation Society. We think that that poaching rate of elephants is now down only to 50 a day. But in a lot of the -- in the wild, in the range countries, some of these animals are being brought extinct by humans. The pangolin, the scaly anteater, is being hunted mercilessly, the eight subspecies of pangolin, are being hunted mercilessly for their body parts. KELLYAnd it could be that we're going to need preserves or zoos. I was just in India, where they've had a breakthrough on the Indian pangolin on breeding. GJELTENDennis Kelly is director of the National Zoo here in Washington, D.C. I'm Tom Gjelten. You're listening to the Diane Rehm Show. And let's go now to Kenny, who is on the line from Sag Harbor, New York. Hello, Kenny, you're on "The Diane Rehm Show." KENNYHello, thank you for taking my call. I'm -- one of your speakers has mentioned Kenya, Tanzania. Well, that's where I was born and raised, in Kenya. And obviously I was very lucky to have the privilege of seeing the wildlife wild around me for most of my life. And I wanted to point out that, for example, the Masai in Kenya now, particularly in the area just south of Nairobi National Park, which you mentioned, are joining forces and their own resources to form a private conservancy. KENNYAnd one of the reasons for that is not to make money necessarily but to prevent the powers that be that I shall not name from building their railway line and their roads right through those migratory territories of the wildebeest and so on. So local people in these countries are definitely educated enough and knowledgeable enough or beginning to be to take a stance on their own. And I'm wondering if the money spent on bringing animals to zoos in the rest of the world might not better be apportioned to really, really creating some amazing educational programs in these countries that are the sources of the wildlife. GJELTENBarbara, and you mentioned, you know, that there are many other ways to experience and appreciate animals that we're unfamiliar with, besides seeing them in zoos, and I think Kenny's comments or suggestion here is relevant there. KINGYes, I would go back to something Dennis said earlier, and certainly United States zoos are not bringing animals from Kenya and Tanzania into the zoos. But other than that, I think it's a very excellent point. I think it is time for us to think very innovatively about conservation, to ask the public when they go to a zoo, or if they are concerned about the plights of animals in certain zoos, where conditions are not very good, what can they do. KINGYou know, there's been a very important movement in the wake of the death of Harambe to actually ask people to take that outrage and channel it. If you can, donate. Donate to sanctuaries. Donate to conservation organizations. If you cannot afford that financially, you know, do what we're doing now. Have this kind of conversation. Let's really put on the table some very important alternatives. KINGMy friend and colleague Laurie Moreno is talking about how we can actually move cetaceans out of zoos, aquariums and theme parks to ocean-based sanctuaries and has a science-based program to do that. So let's get together and start really pushing on the alternatives. GJELTENBarbara, there are a lot of questions here, comments about Harambe, about the situation in Cincinnati and what happened there. Jim, who we're not going to be able to get to, says that the Cincinnati Zoo has always been considered the most professional zoo in the world, it's ironic the accident happened there. We have an email from Caroline in St. Louis, Missouri, I want to put this one to you Barbara, who wonders how the two remaining female gorillas are dealing with the sudden disappearance, death of Harambe. You've written a book on how animals grieve. Do you have any insight there? KINGI have no specific knowledge from the Cincinnati Zoo. I felt it was inappropriate for me to intrude upon that situation with a question about grief at this time. But I do know that when the -- many great apes, when there's a loss in their family group, there is grieving, which I define as social withdrawal or a real change in emotional affect. 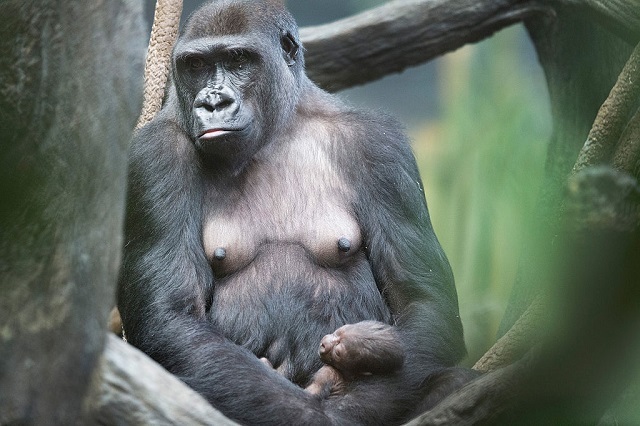 My prediction would be that yes, these gorillas probably are feeling some grief, but we know from the San Francisco Zoo incident, when the 16-month-old gorilla, little Kabibe, was killed by the hydraulic door, her grandmother Bawang did have sadness, did have distress. KINGThis is very much in line with the very reasons why I'm asking about emotional lives of animals in zoos. GJELTENFinally an email from Bud, who says he's a volunteer at the Cincinnati Zoo. He says we're still in grief at the loss of our beloved silverback, Harambe. Nobody has mentioned the fact that the Cincinnati Zoo for many years held the record for captive gorilla births in zoo. Thanks largely to Cincinnati's breeding successes, few if any gorillas are any longer being brought out of the wild to be displayed in zoos worldwide. GJELTENAnd Dennis Kelly, you made that point earlier, as well, Dennis Kelly being the director of Smithsonian's National Zoo here in Washington. He's been one of our guests, along with Barbara King, a biological anthropologist at The College of William and Mary, and Andrew Revkin, a blogger at the New York Times. I'm Tom Gjelten. Thanks to all of you for listening. This is "The Diane Rehm Show."